Sabore's Well project will provide fresh clean drinking water to the residents in Ewaso Nyiro, Kenya. It eliminates the 6 mile walk women & girls make everyday to collect water from a contaminated river & allows girls a chance to attend school. Our goal is to provide clean water to the community, preventing water borne diseases, clashes with wild animals at the river and will free up young girls time giving them a chance to attend school. The 9,000 residents is an estimated number based on a village report conducted to determine the number of families in the community. this is not a school project. Benefits to the women in the community include more quality time at home to be with their children, allowing them the opportunity to work or start a business, allow young girls the opportunity to attend school, prevention of water borne diseases leads to a healthier community. Our goal is to drill wells in the area which will provide a clean water source closer to the villages. It will reduce the time spent walking to the river but more importantly will provide a clean water source for the community. With the source being closer, the women can make several trips for water and not have to carry 40 pounds on their backs. Young girls will also have the chance to attend school because they won’t have to walk with their mothers to collect water or stay behind to care for their younger siblings while the mother is away. Since the water in the area is very deep, we want to provide tanks that will hold the water so women don’t have to wait for it to be pumped to the surface. The land has been donated and is owned by the Community Based Organization called the Oldonyo-Orasha Supetai CBO. The CBO is very proud and anxious to be able to provide a clean water source to the community. The government has to approve that the CBO is owned by the community in order for them to grant them authorization to drill. The government will also conduct testing of the water to make sure it is without contaminants and is suitable for human consumption. The CBO will be hosting seminars to give knowledge to the committee members and the community in general on how to sustain and maintain the water source, keeping it clean and functioning without issue. The CBO may hire a few individuals for security purposes – mainly to keep wild animals away from the source. We are unaware of any other issues at this time. Each family with access to the well will be charged a small monthly fee that will be held in a MPESA account. This will insure that the funds are available for any maintenance issue that arises during the year. The funds will be easier to track with the mobile device and prevent misuse of the money. Community will donate labor costs for implementation of well and will help pay a monthly fee to help with on-going maintenance of well. We have set aside funds for maintenance but want the community to participate so that they will have a vested interest in the well. Please expand on your sanitation plan. You state 9000 people will get sanitation. Your plan only states the costs of building of 2 toilets (i assume somewhere near the water source). Its unlikely they can serve all the people. What is your plan to treat the sewage? We will be building a pit latrine and there will actually be 4 bathrooms built - 2 at each location. All 9,000 people will have access to the toilets but not all will be using them on a daily basis. The toilets will be built at least 75 meters away from the water source so as to not contaminate it. The sewage will be treated with special chemicals (we will provide you with the name when Sabore is able to get it translated). This needs to be thought thru a bit more and i am sure there are many peers on this exchange who you can reach out to and get help. 1. 2 bathrooms at each location (i assume one men and one women's) for how much daily traffic? Even if 9000 use them once a month, there will be 75 users per stall per day. Who is going to maintain them? You might want to check out the design of toilets that Lifewater International built at Nakuru schools. 2. Chemical treatment? I am sure i am not the only who will frown at that. Need to design the septic system well, easy to do in a dry climate like the Mara. 3. Please check out the ARGOSS manual by the BGS on siting sanitation facilities - has a useful checklist to follow. It's good to see Kariuki's hydrogeologic survey. You are in excellent hands with him! I consulted on a project back in 2007 near Narok and there were some challenges. The first attempt at drilling ended up in a dry well. I know the geology is much different there than in the areas we work in Samburu. With this, I would certainly negotiate the cost of a dry well if you have not done so already. What are your plans for hygiene and sanitation training specifically? Is the generator proposed diesel or solar powered? If diesel, what do you project monthly fuel costs will be? Will the funds collected cover this as well as ongoing maintenance? Kristen - thank you for your comments and we would welcome your suggestions and input on how to negotiate the cost of a dry well. Kariuki's survey was very promising so we hope this is not our experience to end up dry with the first wells. We will be setting up some training classes for the women that Sabore will be the beginning instructor and then future refresher courses will be offered by women in the CBO if it appears that the women are not using proper sanitation practices. We will be setting up a hand washing station where they can also rinse out their Jerri cans. The generator will be diesel powered however we have been working with a large company in Nairobi that is interested in helping us use solar power and we are hoping that by the time installation of the wells occurs that we've worked out an arrangement with them to provide solar power for the wells. After the first month of running the generator, we will have a better idea of the fuel costs. At this moment we are projecting that the pumping will occur 1 time a week and will use about 15 liters of fuel @ 130KS per liter we estimate the cost at $23 US per week or about $100 per month and the monthly fees we will be collecting will cover this cost and the ongoing maintenance. We will be setting aside additional funds for ongoing maintenance as we do not want something mechanical to happen to the well and not have the resources to fix it. So happy to see your project finally in peer review given all your hard efforts to date! Could you pls share your thoughts on who will manage the project implementation? Also what are your plans for ongoing monitoring and reporting on the BPN platform to show all your supporters how their investment is producing lasting clean water and sanitation 1,3 and 5 years after the successful implementation of your project. This will be the best way to attract further support to build the 200 wells you want to! Lisa - we are ecstatic that our project is finally on the peer review!! It has taken us a while to get to this point, but we've been happy taking our time to make sure that we are learning along the way and are doing it right the first time!! Being part of the Blue Planet Network allows us to have many resources and so along with Sabore managing the project implementation, we have asked (and he's promised to be there) Lucas Lekwale, who works the Samburu Project, to assist us. His expertise will help Sabore understand the whole process and give him the knowledge to build the other 398 wells. With the Matrix platform that we've recently learned about, we believe this application will assist us in reporting the progress and ongoing successful management of the wells in the future. We will also be using our webpage on the Blue Planet Network website to update supporters on the success of our project. We would like to have a timeline on our page so that supporters can see the progress we've made over time and the careful approach we've taken to insure that all of our donations are put toward an outstanding and fruitful project. I just wanted to add a few follow up questions related to training workshops and maintenance. You refer to setting up training classes and future refresher courses related to sanitation and hygiene. 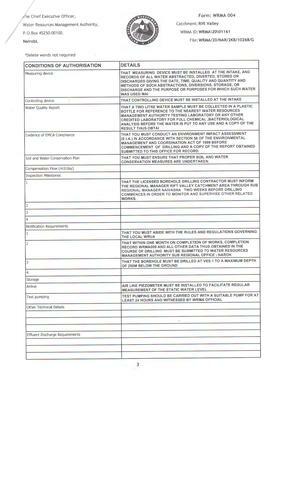 (1) When do you plan to conduct the classes related to the project implementation timeline? (2) Who will attend the classes and refreshers and why will they chose to attend? (3) What specific topics will the classes focus on and how were these topics decided on? You also discuss a monthly maintenance fee. How will you ensure payment? In other words, why/ how will community members continue to pay regularly if they hit a rough patch and have a hard time making ends meet that month? Looking forward to learning more about your project and plans. 1) The training classes will be conducted upon Sabore's return to Kenya in March. Sabore will be bringing the Narok County Public Health Officer to help with giving the training to the community. Sabore has already had a conversation with the officer and he is prepared and willing to help make sure the community uses proper sanitation practices. 2) It will be mandatory for one member of each and every village to attend at least one training session. Sabore has already explained to members of the community the procedures he will be putting into place in order to maintain a clean and healthy environment. One unique feature of this project is that Sabore lives in the community where these first wells are being drilled and understands the importance of overseeing the activities that will take place and will instill proper sanitation and maintenance. 3) The topics will include basic sanitation, hand washing, not defecating near the wells, using the toilets provided, rinsing Jerri Cans prior to use, and the importance of maintaining and sustaining the borehole to prevent water borne diseases. Payment of the maintenance fee will be handled thru M-mpesa, the banking system available on cell phones in Kenya. We will have a dedicated phone for collecting the fees and the systems provides for tracking of fees. Hi Sabore's team, can you clarify how the generators will be used,maintained and sustained bya community? Don't you see the technology you have employed is going to be very costful to the community? Once the generators are in place and are pumping the water, we will be able to determine how frequent they will be needed to be maintained. This will be based on the depth of the water and the number of times the holding tank will need to be replenished during the week. Again, Sabore will be there and monitoring the generators and wells to make sure they are functioning properly. That's the uniqueness of our project is that it being completed by someone living in the community, not someone from elsewhere. Our hope is to convert the generators to solar or electric pumps at some point to reduce the cost but we have figured these expenses into our project and will be leaving funds available to assist the community should it be necessary. Its the first time we are working with a community directly and expect a different peer review format and also different reporting and monitoring process. 1. how much is the drilling cost per well? Is it 19,350? What is the total cost of the installation? What is the source of the estimate? We have different estimates from The Samburu Project in Kenya and others in Uganda. 2. Why have you decided on an electrical pumping system with generators? Would a handpump not work like in the projects mentioned above? You could do at least one more well for another community. 3. What type of storage tanks? How high will they be? Is there a distribution system or people have to come to the tank? 4. What is the plan on report writing? Who is going to do it? What Analysis, Compilation and Printing do you plan to do? If you are using the online platform you don't need to spend time with any of the above? 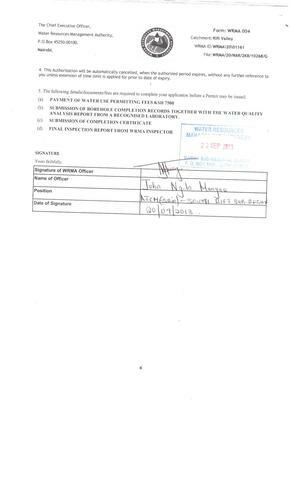 The drilling per well is $19,350 and that number was taken from the proposal Sabore received from Indepth Water Services and Management Ltd. 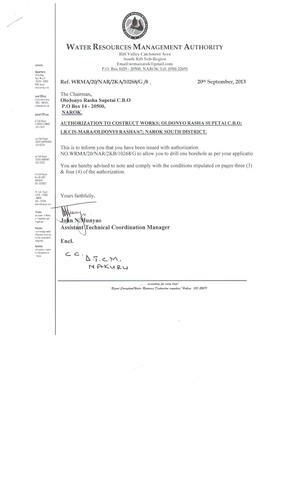 The company was referred to us by the Ministry of Water in Narok as being the best drilling company in the area. If there is a way for us to attached one of the quotations for review, we will do that. The estimates from Samburu and Uganda are different because they do not have to drill as deep as we do in Sabore's area. 2. The reason we have chosen to use generators is due to the depth of the wells. The hand pump will not work for our wells. We would welcome the opportunity to do more wells for the community but due to the depth of the water, we are not sure that will be possible with this round of funding. 3. The storage tanks will be 100,000 liter and will be placed on top of a platform. The tanks are about 11 feet tall but will be higher due to the platform it rests on.. We do not have a distribution system. The people will have to come to the tank. 4. The report writing will be done by Sabore and the secretary of the CBO. We were not aware of the online Matrix platform until we were completing the proposal. We are hoping that will eliminate this expense but have left it in there as a precaution since online access is not always available in the area. 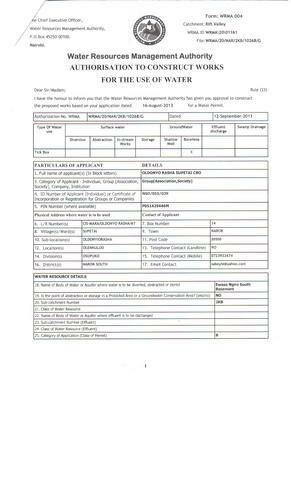 We have added the drilling proposal from Indepth Water Services and Management LTD for your review. The quotation is in Kenyan Shillings and we have used an exchange rate of 84 to 1. In addition, both hydrological surveys for the two wells have been attached. 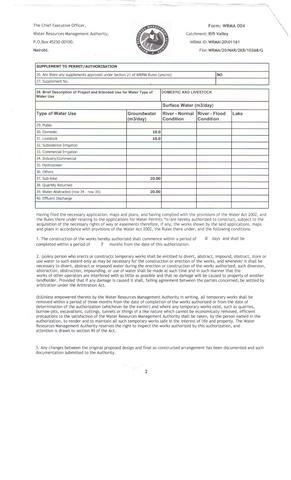 We have added the drilling proposal from Indepth Water Services and Management LTD for your review. The quotation is in Kenyan Shillings and we have used an exchange rate of 84 to 1. In addition, both hydrological surveys for the two wells have been attached. The organization is not really formed, agreed. The proposal is not strong, agreed. However, it is the first time a CBO is using PWX. If they use the platform and the network, it would send a strong message to the sector. Even if the project does not succeed, if we can track all the learnings and issues, it would be very valuable. That is the big risk: will the community work with the platform, the process, and the network? While we applaud Sabore's Well's commitment to ending the drinking water crisis in Ewaso Nyriro, we do have some concerns about their approach, especially with regard to project design and sustainability, and thus would suggest that the team take some additional time to think through the approach before proceeding with implementation. Regarding project design, we are concerned about the installation of only four toilets for a community of 9,000. We imagine that demand for these toilets will greatly outstrip supply and worry that the toilets will depreciate rapidly and become abandoned fairly quickly after implementation. We would like to see more of a plan on how these assets will be maintained and how they are adequate to solve the sanitation problem in the area. More worrisome for us is the plan regarding project sustainability. Regarding financial sustainability, there does not seem to be much of a plan in place to actually enforce collection of monthly tariffs. How will tariff payments be enforced with a community so large, especially with public wells? How have tariff levels been set, and how can we be sure that they will be adequate to cover annual repairs? We do not see much of a plan in terms of training and capacity development, which we view as one the most critical elements of our work. We do not think that 1-2 workshops on sanitation/hygiene best practices is adequate to ensure correct use of the water system. We would like to see an actual program of several training modules to build core skills among the community members, such as conflict resolution, accounting, conducting repairs with a life cycle mindset, etc. At the very least, a core group of leaders from within the community should be trained along these lines to ensure the project will be sustainable. Finally, we'd like to better understand who will be in charge of maintenance. How will that person be trained, and compensated for his/her efforts? What is the succession plan if that person is one day no longer able to maintain the system? Spending extra time thinking through these details and developing a detailed plan to account for them is a critical next step to ensuring that the projects have the intended outcome 5 years after they are built. I'd like to see details on these before I can provide a recommendation to move forward.